From sitting on the porch listening to crickets in the fields to roaming free in wide open spaces, there’s a lot to love about country living. It’s a simple life spent with family and friends, and it’s no surprise the lifestyle has inspired a popular trend in home design. The farmhouse style is all about the rustic and comfortable. It’s bright spaces and repurposed materials with a whole lot of country charm and small town appeal. The best part is, you don’t need to live on a 50-acre horse farm to have farmhouse decor work in your home. You also don’t need a huge budget. A big part of the farmhouse style is knowing how to repurpose and recycle items to give them new life. 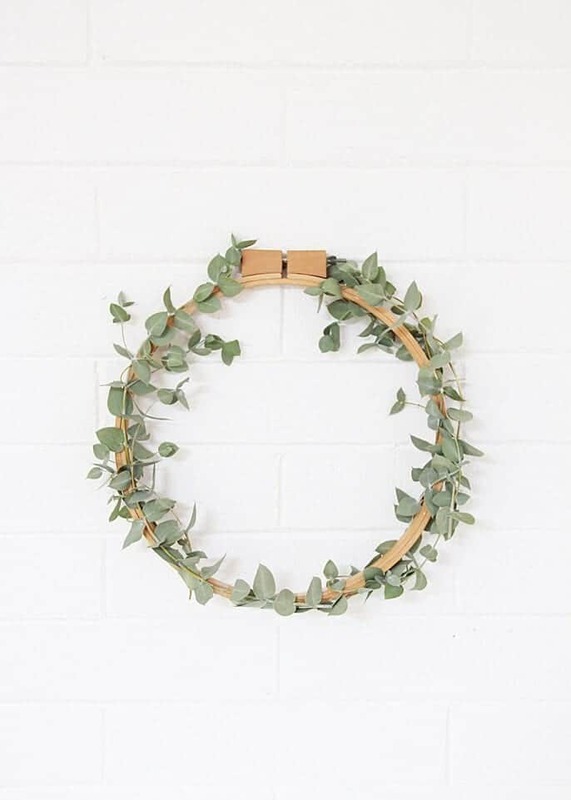 You could go to an expensive home decor store and spend big money on new home decorations, or you can get a little dirty and try out these great DIY ideas. We’ve picked out our favorite DIY farmhouse decor projects that are easy to assemble and will make your house look like the perfect country farmhouse. 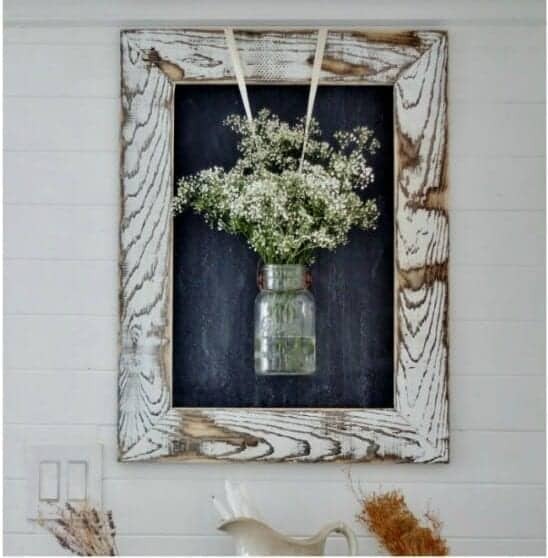 We’re starting off the list easy with this farmhouse-friendly rustic wood frame. This piece of farmhouse decor is great because of its versatility. You can use it as a message board in the kitchen or dress it up and move it into a hallway or living room. 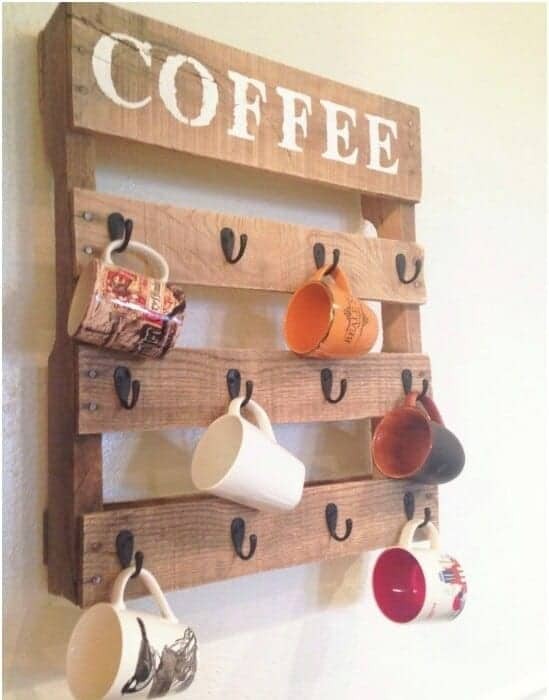 This cute coffee cup rack is made from a wooden pallet you can find for free or dirt cheap at certain stores. Try asking your local hardware or garden store if they have any small pallets they’re willing to get rid of. A lot of stores end up trashing old pallets anyway, and they’re happy to let DIY homeowners dig through their trash. Even if the pallet you find is less than perfect, a little bit of damage will only add to the charm. We love this project because it’s so simple you can knock it out in only an hour. 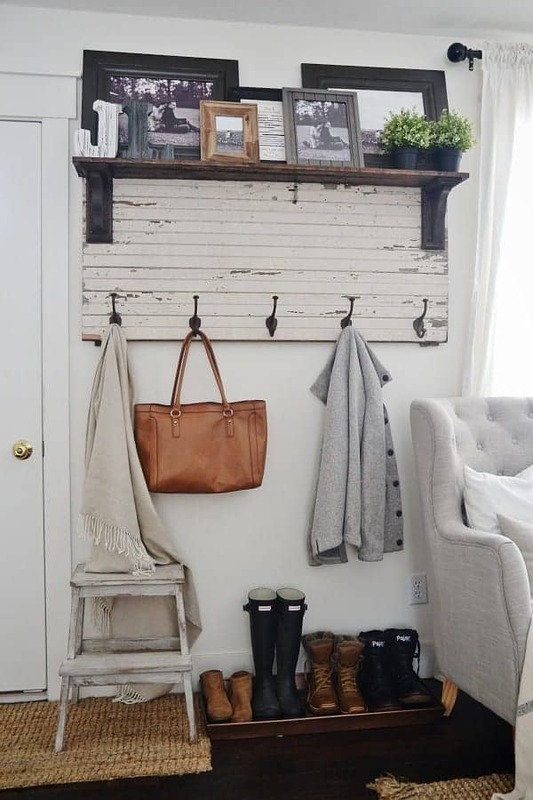 All you need is a pallet, some paint, and a few hooks. It’ll look perfect in your farmhouse kitchen, and it’ll keep your coffee cups from crowding your cabinets. Check out the tutorial on how to make it with One Little Bird Blog. 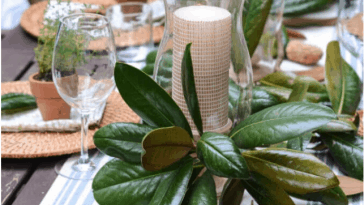 No farmhouse table is complete without a rustic centerpiece. This simple crate centerpiece allows you freedom to dress up your table for any season or holiday. You can fill it with flowers, candles, or anything else your creative mind can think of. This project is also a good one for when you have scrap pieces of wood left over from a bigger project. It doesn’t take much to make this farmhouse style box, but it’ll make all the difference for your tablescape. You could even use it in the bathroom to organize toiletries or in a nursery to hold essential supplies–like diapers. 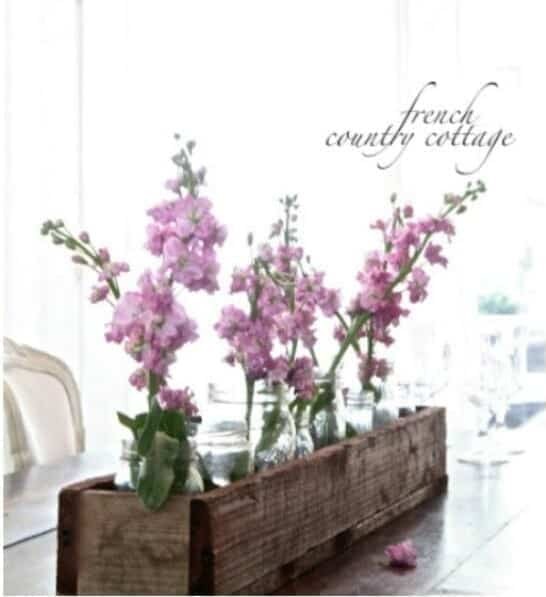 Learn how to make it with French Country Cottage. 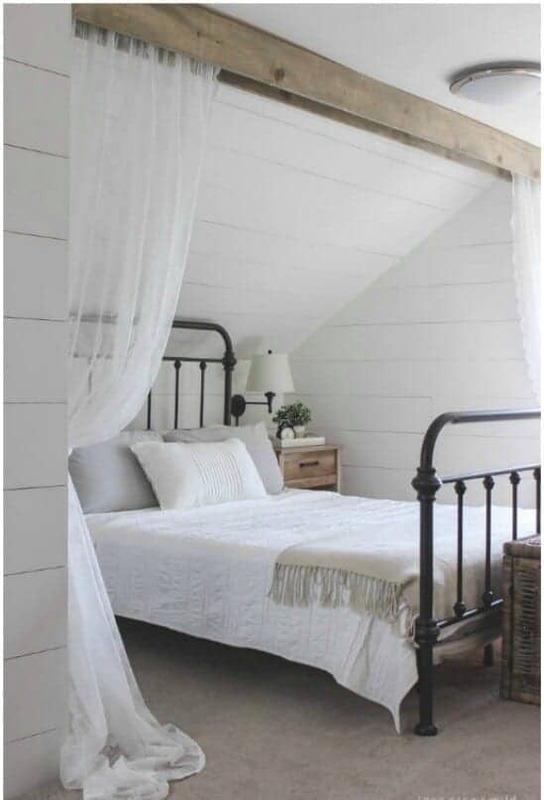 This simple addition will turn any boring bedroom into a beautiful farmhouse escape. It might look complicated with that wood beam attached to the ceiling, but this piece of farmhouse decor is the type of project you can finish in one afternoon. The key to making the most of this idea is to use the right kind of materials. To follow true farmhouse fashion, look for recycled barn wood and vintage-looking lace. It might work best in an area with an alcove ceiling, but you can make this look work in almost any space. Love Grows Wild has all the details. 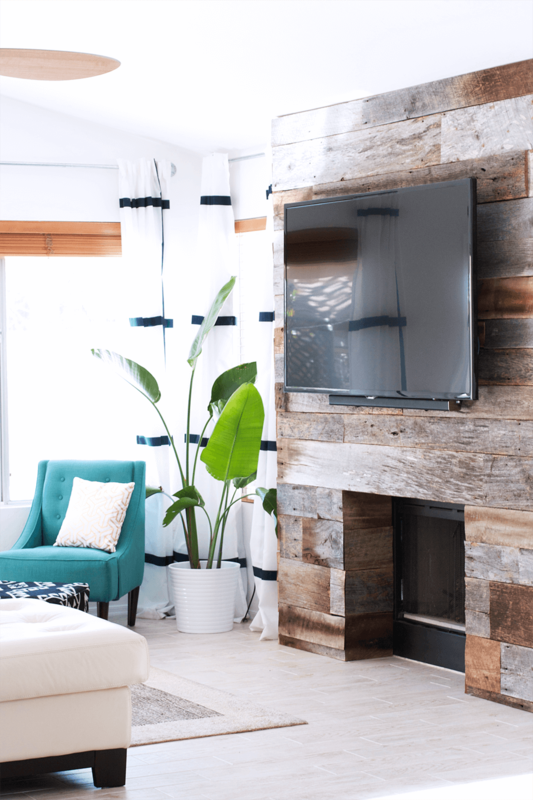 This scrap wood wall is a little more involved compared to the simpler projects on this list, but with the right tools, it’s not as hard as it looks. 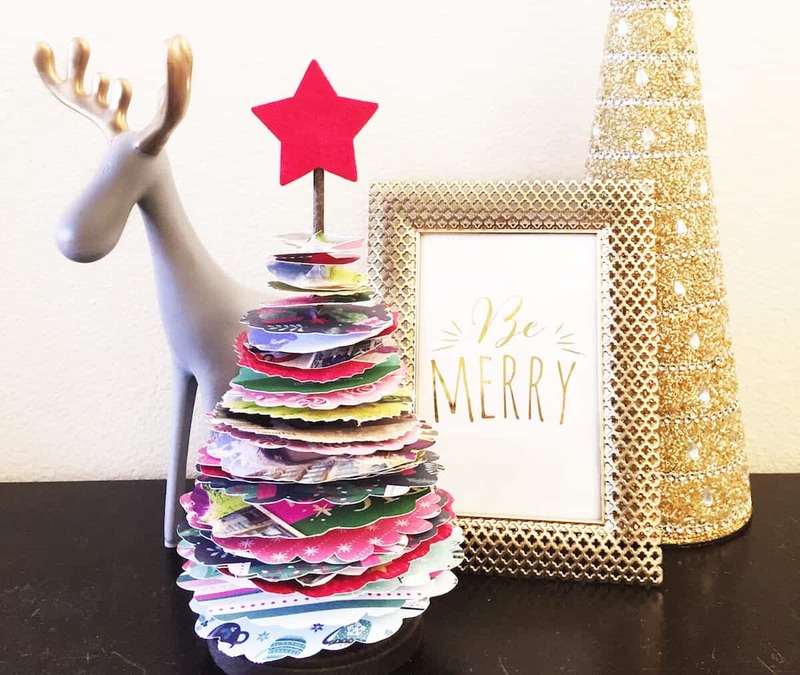 DIY blogger Pretty Handy Girl used this idea to add interest to her bonus room/art studio. It’s the type of feature wall that is great in farmhouses and can be used to display artwork and other decor items. To make a true scrap wall, go through your workshop for salvageable pieces of wood, and you can even ask friends and family to donate whatever scrap pieces they have lying around. There’s also the option of deconstructing a few wooden pallets. If you absolutely need to buy new wood planks, that’s fine too, because Pretty Handy Girl also has a tutorial on how to make new wood look old. This DIY farmhouse decor project serves the duel purpose of looking good in your home and keeping your family and household organized. Message boards are great for those busy days when you’re racing between dance rehearsals and soccer practice while trying to keep everyone fed without losing your sanity. You can have a stack of random sticky notes, or you can make your household’s communication station blend in with the rest of your farmhouse decor. 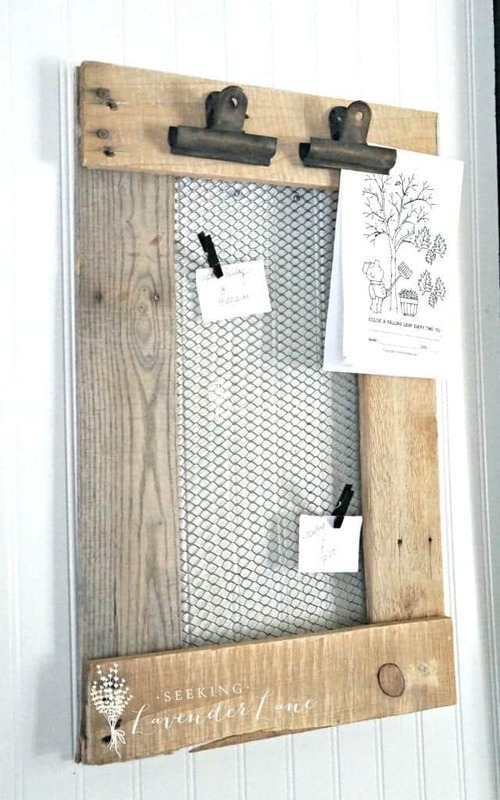 This farmhouse style message board is easy to make and will do wonders to keep your family organized. Deb from Seeking Lavender Lane used old pallet wood and chicken wire for this project. You can complete the look by finding neat vintage clips in a color that match the rest of the room’s design. Find out how to make it here. 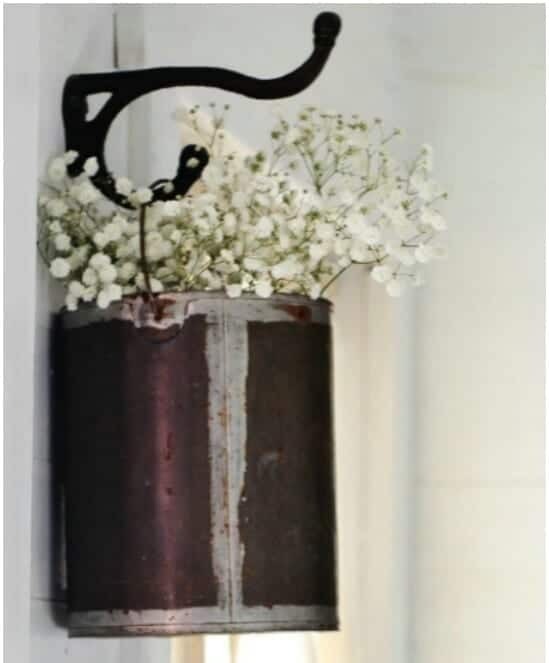 Farmhouse style decor is all about getting creative and giving old useful objects new jobs to do. 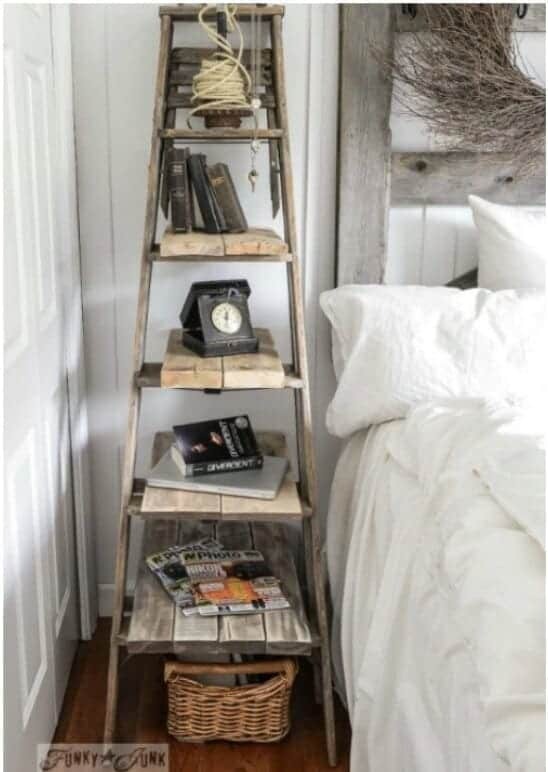 This step ladder turned shelf/side table is a perfect example. You can use it in your living room to display other decorations or pictures, or it would also fit in your bedroom as a handy bedside table. For this project, it would be ideal if you already have an old step ladder taking up space in your garage. But if you don’t, they’re not hard to find. Keep your eyes peeled the next time you hit up a thrift store, auction, or yard sale. These things are out there, you just need to find them. And once you find the perfect ladder, all you have to do is turn the steps into shelves. Funky Junk will show you how to do it. 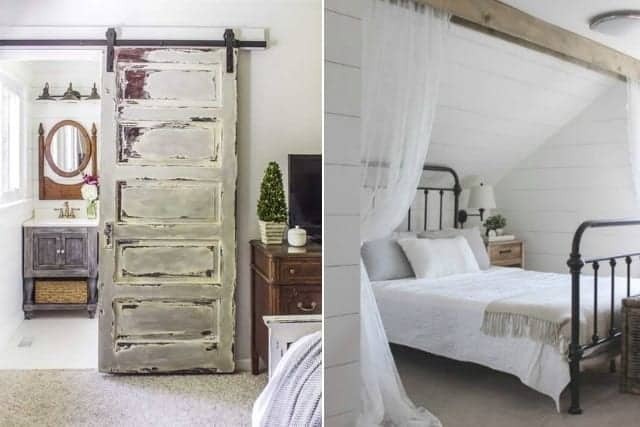 Can you really call your home a farmhouse if you don’t have at least one of these sliding barn doors? They’re the epitome of farmhouse decor, and they’re a lot easier to install than you think. The best barn doors are made from old barn wood, but don’t let a lack of recycled wood planks hold you back. In this online tutorial, Rachel from Shades of Blue Interiors uses an old door she found on Craigslist. She sanded it down and painted to get the perfect rustic look. 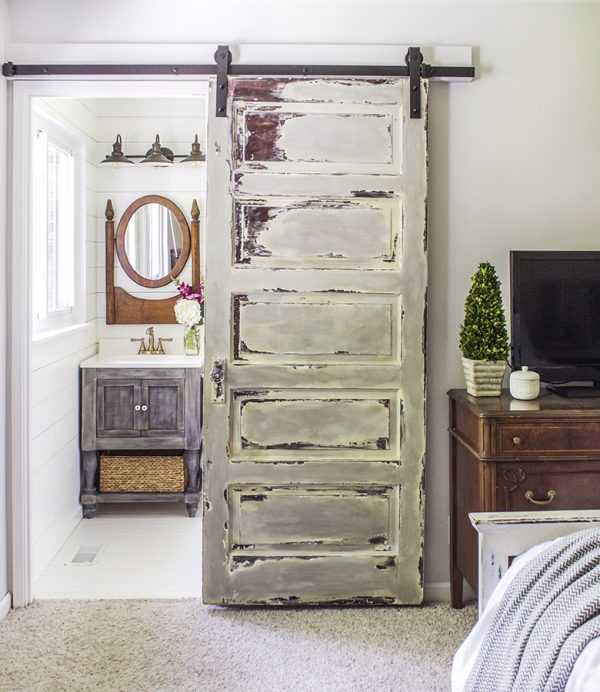 Her DIY sliding barn door closes off her master bathroom, but you can put yours anywhere in your house. They’re especially great for home offices and media rooms. No matter how big your family is or where you live, we all share one simple problem. Entryways inevitably turn into cluttered drop zones where people shed jackets, shoes, backpacks, and whatever else they can’t bother to carry with them. You can deal with the mess, or you can craft a solution that also fits in with the rest of your farmhouse decor. If you’re ambitious (and good with a band saw) you can make this rustic entryway coat hanger from scratch. 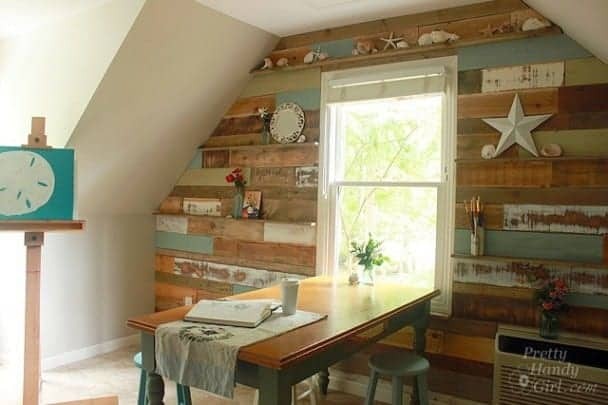 For an easier route, you can fashion it out of something like an old barn door. This project is great because you have freedom to design everything how you want. Pick a color that you like and add as many hooks, shelves, or even cubbies as you like. Check out Liz Marie Blog for the tutorial. 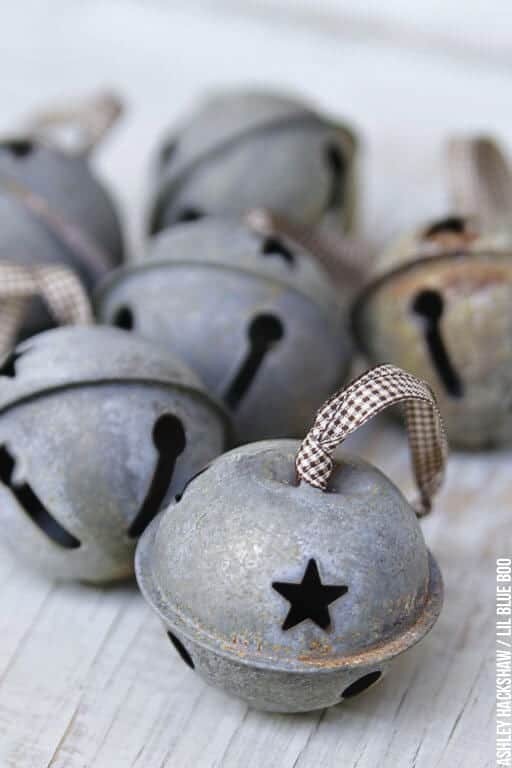 In true DIY farmhouse fashion, this little project is a great way to use up the “junk” you have leftover from a major remodel or painting spree. And depending on what you have to work with, it could be as easy as hanging a cast iron hook and buying some flowers.